First, a musculo-skeletal examination is performed. At MOST we use the TPI evaluation or portions of it when establishing a base line for assessing a golfer’s physical attributes. Golf requires flexibility, strength, and coordination to perform at one’s best and these are components assessed in the MOST golf fitness evaluation. Secondly, we use the KVest 3D system to evaluate torso, pelvic, and upper body movement in real time during the golf swing as an evaluative process as well as a training tool for learning movement position and awareness. And thirdly, we use the Instant Replay system (which in not used at TPI) to enhance kinetic linking and motor learning with the golf swing. This is a system invented and patented by Ralph Simpson; it was developed over a decade of working with the best players in the world. Although strength enhancement can improve club head speed a small amount, learning to sequence and weight shift optimally has a much greater effect on a golfer’s ability to generate club head speed. There is no faster way to affect this process than the Instant Replay. Upper Torso: This exercise activates the spinal rotator muscles preparing them to do work as well as increasing their strength and endurance thereby preventing and treating back pain. Back Swing: Using the INSTANT REPLAY for back swing patterning improves torso range of motion within a golf-specific pattern. Resisted Swing: The resisted swing movement builds strength and power from the pelvis and legs allowing a more solid move through the shot. Accelerated Swing: The accelerated swing uses sensory-motor pathways to teach the four components of skilled athletic movement. Shoulder Accelerated Swing: Adding it all together, this move links the upper body and pelvis to complete the feeling of proper loading, weight shift, timing, and rotation on the take-away as well as impact and follow-through. Quadrant Moves – Right Leg & Left Leg: Quadrant exercises are designed to prevent and treat low back pain by improving strength, endurance, and control in hard to train low back and abdominal muscles. Although both movements demand deep spinal muscle activation, the extension quadrant exercise favors the low back extensor muscles, while the flexion quadrant maneuver preferentially stresses the oblique abdominals. Side Lunge – Right Leg & Left Leg: The lunge is an indispensable power developing exercise. The INSTANT REPLAY Lunge promotes hip power while incorporating the torso rotary muscles necessary for a powerful move through impact. 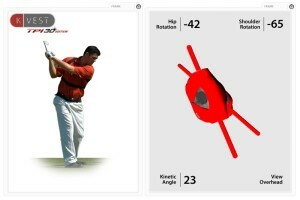 K-VEST TPI 3D system uses the latest technology to investigate components of your swing and body movement, in an effort to locate inefficiency and power leaks. 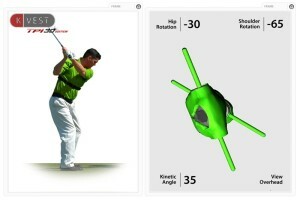 Correcting these problems immediately and add distance to your ball flight.